So much has been said of the “white man’s burden:” namely, how the collapsing American Empire and bygone British Empire have shouldered the burden of civilising Africa and driving the global economy for centuries. The opposite is true. The fact of the matter is that not only was Western civilisation invented by black Africans in ancient Egypt, Africa has driven global economic growth for centuries. African natural resources, labour, land, slavery and skilled émigré – as any decent economic historian will tell you – have fueled the world’s economy for many, many decades. To this day, Africa is the world’s engine-room for growth. In short, driving global economic growth abroad, whilst benefiting little at home is the “black man’s burden.” That Africans know that there are immense riches just beneath their feet as well as just above their heads in High Office, only adds to the burden. The roots of “Western” civilization, technology, religion, culture and science are to be found not in Greece, but in Black Egypt. Infact as early as 9,000 BC to 500 A.D. black empires, from the prehistoric Zingh Empire of Mauritania to ancient Khemet of Egypt, were at the forefront of development in technology, politics and culture. Far from “civilising the natives,” Europeans replaced communitarianism, cooperation and spirituality – that prevailed across Africa – with a corrupt, aggressive and inhumane form of civilisation. First there was the brutal kidnapping of millions of Africans, so as to replace the indigenous Americans that Europeans had wiped out. The slave trade broke the back of African economies whilst creating capital for plantation owners that kick started Europe’s industrial revolution. After World War Two, Europeans were severely weakened by years of unremitting industrial slaughter of each other. To make matters worse, liberation movements were gaining momentum. This ultimately made the cost of containing “restless natives” greater than the benefits Europeans could extract from them. As British power wained the baton of colonialism was passed to American imperialism. Poverty and disunity have been the essential ingredients that have allowed this neo-colonial exploitation to continue. But, thanks largely to soaring mineral prices and Chinese win-win investments, poverty levels are beginning to tumble. Disunity however persists. America is making sure of it. Washington is fomenting disunity by funding reactionary neo-liberal political parties across the continent as well as the odd “good dictator.” A bad dictator however, named Muammar Gaddafi, was hunted down and assassinated by Washington. Not least because of his plans for an African IMF, gold backed Afro-currency and a United States of Africa. In essence, Colonel Gaddafi’s plans for African unity were as good as a hand written suicide note addressed directly to NATO. By losing Gaddafi, Africa may also have lost Libya. For, NATO will ensure that Mr. Gaddafi’s plans for African unity will be smothered in their crib. Then ofcourse there is United States Africa Command (AFRICOM) which will almost certainly establish a military base in Libya. Infact any African government that America offered money to host AFRICOM, Mr. Gaddafi would offer double the amount to refuse. Mr. Obama would have us believe that hundreds of highly trained US Special Forces are braving tsetse flies, dengue fever and are running around in the African bush to flush out Ugandan rebels. All for freedom and democracy. Coincidentally in one of the most oil rich enclaves on earth. 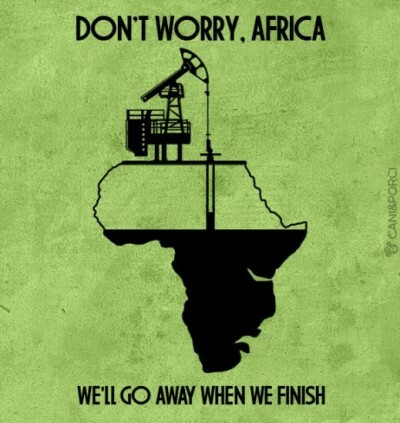 Home to Sub-Saharan Africa’s biggest onshore oil discovery in 20 years of two billion barrels. The new cold war between America and China will be over resources, not ideology. Africa will take centre stage. Should America’s hard power and divide-and-rule approach triumph, Africa may descend into one large theater of war with many actors, chapters and a tragic ending. Should China’s soft power and win-win economic approach triumph, this may end up becoming a truly African Century. To this day, Africans produce cheap, often slave labour and ship raw materials north for peanuts. In return Africans purchase finished products at a premium from the north. This skewed trade relationship is what helped build the west and underdeveloped Africa for centuries. Reversing this trend would allow the black man to free himself of a centuries old burden. Reversing this trend is this generation’s struggle. That said, Africa’s future looks bright, for the ingredients are present for an economic boom, which actually benefits Africans: favourable demographics, a commodities boom, a burgeoning middle class and growing enthusiasm for technology with more than 600 million mobile-phone users—more than America or Europe. If Africans resolutely build the capacity to refine their own crude oil, gold and platinum as well as the capability to cut and polish their diamonds, they will certainly turn this into an African century. If Africans staunchly defend their resources and turn them into finished products, they will finally turn the “black man’s burden” into Africa’s renaissance.